Picker Components' PC796 is ideal for motor controls, which utilize normally closed contacts for dynamic braking. (PRLEAP.COM) CARROLLTON, TX - MARCH 18, 2015 - Picker Components, a quality leader in design and manufacturing of electro-mechanical and solid state relays, today announced the release of its PC796, an automotive 80/60 amp power relay with plug-in and PCB mounting options. The PC796 is designed for motor drive applications utilizing the Normally Closed (NC) contacts for dynamic braking. Picker Components is a trusted supplier of superior relays due to stringent controls on its materials and design excellence, which achieve lower internal resistance, less heat and higher reliability. "We took our highly dependable PC795 and improved its design to greatly reduce the Normally Closed (NC) contact bounce time. The result is a significant increase in reliability and product life, as reduced bounce time means less time the contacts are in an arcing state, which helps reduce material transfer at the NC contacts," said Jim Kasle, General Manager for Picker Components. "With the release of the PC796, our bounce duration is now half of our nearest competitor's relay," states Kasle. The PC796's primary application is motor controls utilizing the Normally Closed contacts for dynamic braking. Shorting of the motor windings field produces dynamic breaking, which enables the motor to stop instantaneously. 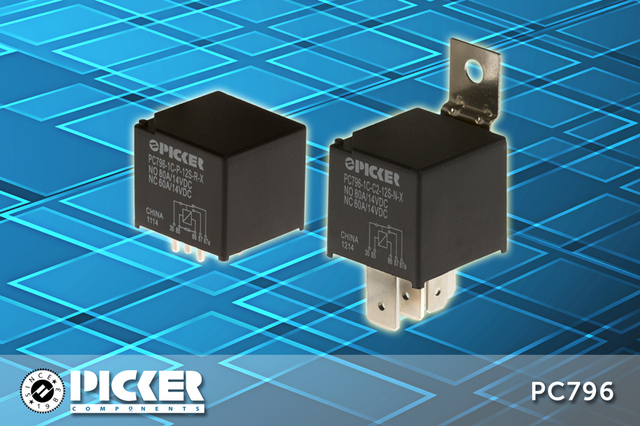 For complete specifications, please review the PC796 datasheet available at www.pickercomponents.com/pdf/Relays/PC796-Data-Sheet.pdf. Pricing for the PC796 is $3.59 ea. for the plug-in Mini ISO and $2.75 ea. for the PCB mount in quantities of 1000 pieces. For a complete list of representatives and distributors of Picker Components' products, visit www.pickercomponents.com/distributor.php. Founded in 1983, Picker Components manufactures and distributes a wide range of Automotive Relays, General Purpose, Power Relays, Signal Relays and Solid State Relays. Picker's product line spans from the tiniest fractional current rated Signal Relay to powerful 50 Amp Power Relays and 150 Amp Automotive Relays. Picker's superior quality contacts are alloyed in Japan under the most exacting requirements. Picker is the only major relay factory in China that does not use Chinese-made contacts. The actual formulation of Picker's contacts is highly proprietary. For more information, visit www.pickercomponents.com.